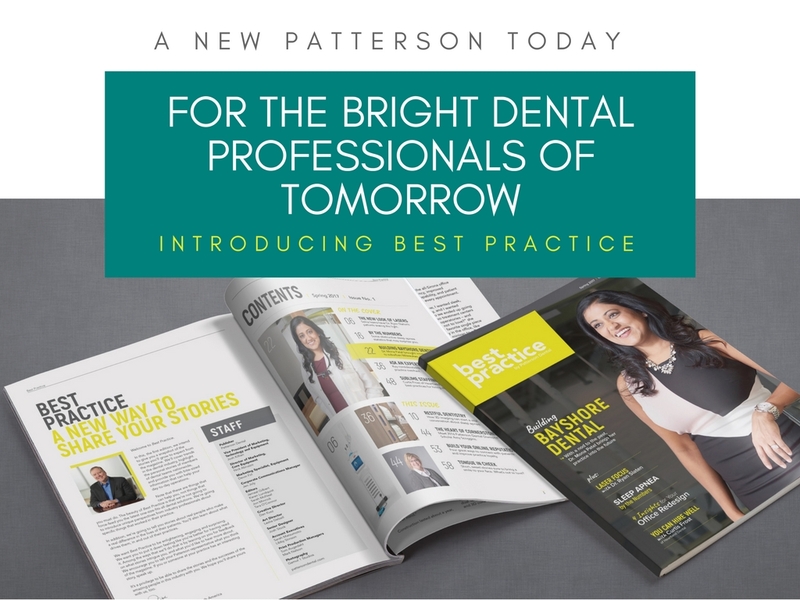 In late-winter 2017, Patterson Dental turned the page on its established technology and equipment publication. Since the 1990s, Patterson Today has been a showpiece for industry leading design concepts in modern dental practices, as well as a vehicle to highlight our vast array of products and services. The rebranded publication will enjoy a completely overhauled design, with an updated color palette and sharp, modern graphic elements. 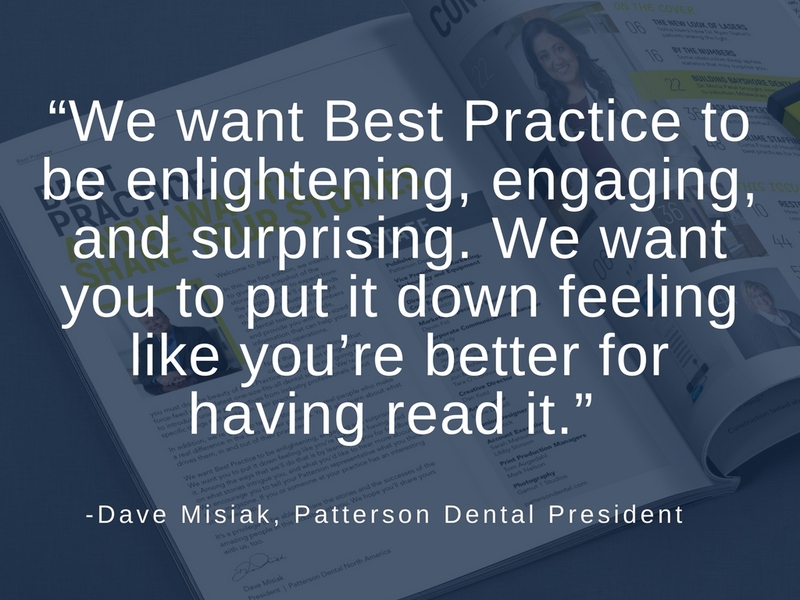 The first issue of Best Practice features articles that run the gamut – feature-length stories on dental industry personalities, ideas for improving the look and feel of a practice, in-depth overviews of industry events, practice management tips, and much more. 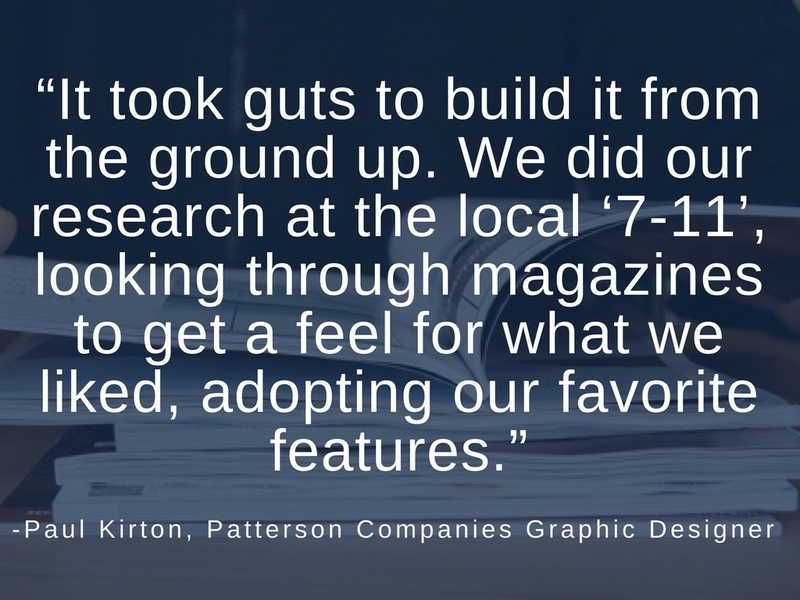 Current Patterson Companies graphic designer Paul Kirton worked on the very first Patterson Today, and has witnessed the publication – and the company – grow and change over the years. Kirton, who wore many hats on the two-man team that produced the very first issues – along with former marketing director Todd Mueller – served as art director, print buyer, proofer, layout artist, and even product copy writer! 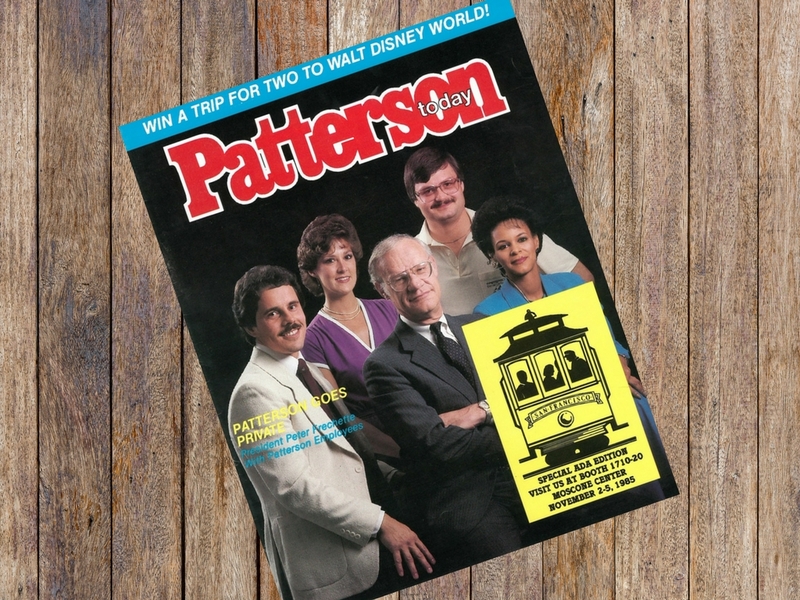 This is the cover of the very first issue of Patterson Today, released in 1985. When asked what he likes best about the redesigned publication, Kirton didn’t shy away from visual elements. Best Practice will also have a wider range of story types, while still keeping dental practice redesigns as a central and recurring feature. At its core, the new magazine is looking to appeal to a wider audience in hopes of gaining both readership and sponsorship. Patterson Companies manager of print production Tom Augedahl worked on over 60 issues of Patterson Today before stepping in to help guide the new concept. Augedahl also noted updated dimensions of the publication – a standard 8 x 10” – and another upgrade which will help images pop off every page. 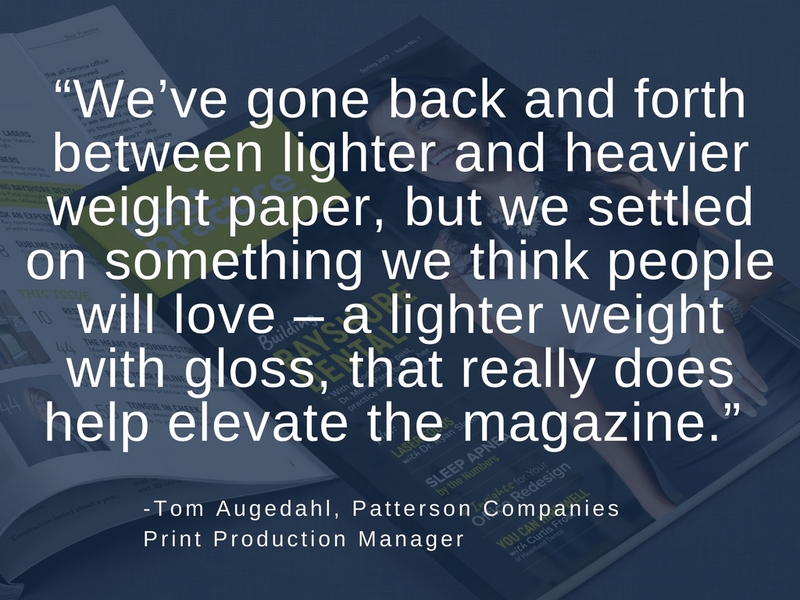 “We’ve gone back and forth between lighter and heavier weight paper, but we settled on something we think people will love – a lighter weight with gloss, that really does help elevate the magazine,” he said. 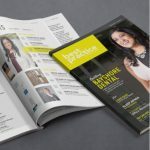 While Best Practice will first exist as a print-only publication, the company has designs on an online home as well, where the opportunity to engage with readers via social media and evergreen content is an exciting prospect. For now, a fresh look and expanded vision is enough to keep everyone busy as the launch continues. Are you looking forward to thumbing through our new publication? Do you know a peer who should be featured in an upcoming issue of Best Practice? What topics would you like to see us cover? Let us know in comments below, and be sure to keep an eye out for the inaugural issue of Best Practice in YOUR practice’s mailbox soon! Do we need to order this magazine, or will we automatically get it as a customer? Hi Gail, as a Patterson customer your business will automatically receive Best Practice magazine. ❤️ The first issue will be mailed the week of April 10th, so keep your eyes peeled! Is there a cost to the publication? If not, please be sure Dr Glenn Shulkin is a subscriber. Hi Joel, there is no cost to you to receive Best Practice magazine! We will double check to make sure Dr. Shulkin is on our mailing list, thanks! Previous customer – are they eligible for this magazine? Is it possible for Patterson employees can receive this magazine? Hi Cynthia, which office do you work out of? Our corporate headquarters in Minnesota has lots of copies, and we’d be happy to send you one if your branch doesn’t receive one – my guess is you will, though! We already receive 2 other copies and want to know if we can consolidate and take this one off the list to receive mail please? It makes sense that even if you LOVE the new Best Practice Magazine, you don’t need 3 copies. We’ll look into this for you, and try and get your practice consolidated to one mail recipient! Thanks for your patience. Do we have a web based version of the magazine too. i.e. an equivilent to http://www.pattersontoday.com? or is it only a print media publication? Hello! Is there a web based version of the magazine too?